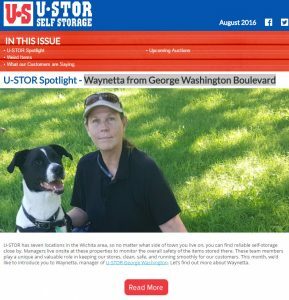 U-Stor Spotlight – Waynetta from George Washington Boulevard – Managers live onsite at our properties to monitor the overall safety of the items stored there. These team members play a unique and valuable role in keeping our stores, clean, safe, and running smoothly. This month, we’d like to introduce you to Waynetta, manager of U-STOR George Washington. Let’s find out more about Waynetta. What Our Customers are Saying – Kind words from happy customers. When they’re happy, we’re happy. Upcoming Auctions – At least twice a month, we hold auctions at one or all of our seven U-Stor locations. Auctions are silent-bid only. Follow us on Facebook to find out when storage units are available for preview. Open the newsletter to find dates and locations.